I'm excited to be joining the Secret Recipe Club (Secret Recipe Club) this month! My assignment was to choose a recipe from Jenna's Cooking Journey, and I had a really hard time choosing because she had so many great looking recipes to choose from. Jenna didn't start cooking until college, but she's certainly been busy since then and become quite a good cook if all the recipes and pictures on her blog are any indication. She lives in Wyoming with her husband, who helps her eat all those delicious creations. Cranberry Vanilla Coffee Cake and Reuben Burgers were two of the recipes that caught my eye, but I finally decided to make Crock Pot Tex-Mex Chicken and Dumplings. I made a few changes, mainly because I didn't have the exact ingredients, but I think the overall taste was pretty much the same. 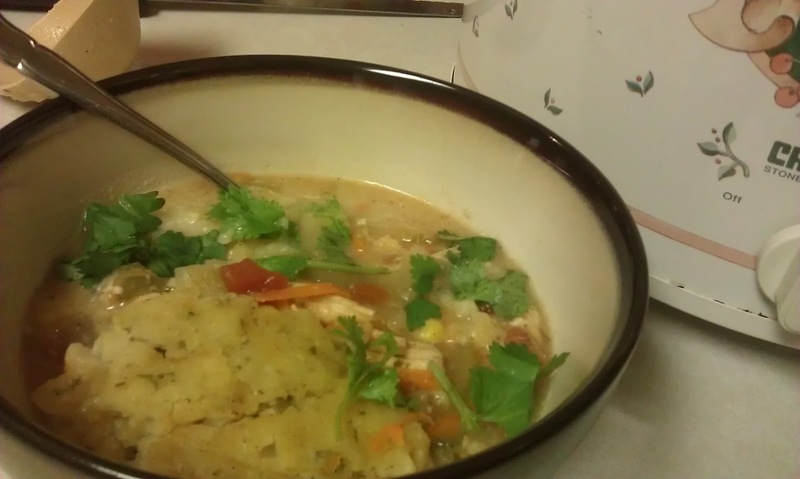 I am definitely planning to make this again, because it was so good! Cook chicken breasts for 2-4 hours on low. Pull chicken breasts out of crockpot and shred chicken. Place all other ingredients for the stew portion of the recipe in the crockpot, and then put the chicken back in and mix well. Cook on high for 2-4 hours. Mix all the ingredients together for the dumplings until the ingredients form a batter. Drop tablespoons of batter into the stew mixture and cook for approximately an hour on high until dumpling dough is cooked. 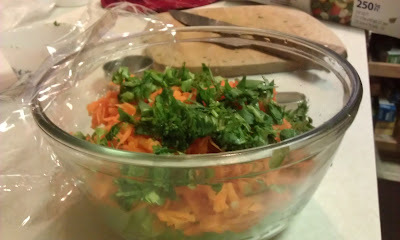 To serve, spoon into bowls and garnish with cilantro and/or sliced green onions, if desired. Jenna's recipe called for a carton of chicken broth, which I did not have and wasn't sure exactly how much chicken broth is in one of those cartons, but I substituted what I had - a tub of the Knorr® Homestyle Stock, and that worked just fine. Ordinarily I would have pulled some chicken broth out of the freezer, but I'm out right now. I substituted Red Gold petite diced tomatoes with lime and cilantro for the Rotel in the original recipe and frozen corn kernels for the Mexicorn. 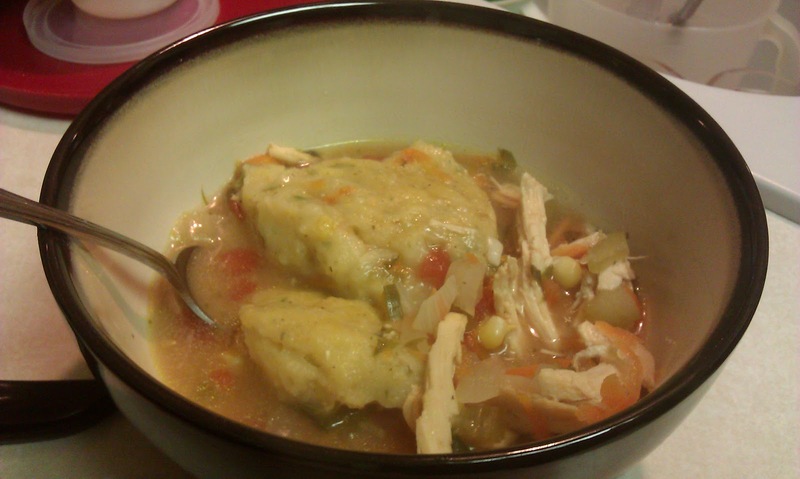 Because my husband doesn't like things too spicy, I just used one jalapeno in the whole recipe - 1/2 in the stew and 1/2 in the dumplings. It was still very nice and flavorful, even for me, and I love spicy! I loved the veggies in this, and the carrots added just the right touch of color. I probably had more carrots than I was supposed to because I didn't measure, just peeled and grated two carrots and threw them in. The only thing I wasn't too sure about was the dumplings. The batter was much thinner than any dumpling batter I'd every used, not that I've really made dumplings that much in my life... Also, there seemed to be more batter than I could use. I covered the top of the stew with spoonfuls of batter, and I still had quite a bit left. Was it my fault for using milk instead of fat free half-and-half - what is that, anyway? Maybe should have done some research first. or maybe trying a different recipe for the dumplings, perhaps something from this page of Corn Meal Dumplings recipes, with a thicker batter that uses more corn meal, adding the jalapeno and cilantro, of course. I especially loved the little bits of jalapeno in the dumplings. So good!